Sawdust Hole is a National Forest Campground which was once the location of a saw mill on the Manistee River. Campsites are rustic, and the North Country National Scenic Trail passes nearby via a short connector. Camping- eight primitive campsites with fire rings and tables. The connector to the NCT is marked with a carsonite post. There is a widened place in FR 8799 0.2 mile from the turn off Tippy Dam Road. This is where the road begins to follow the edge of the bluff above the river. Follow the bluff away from the road (north) and you will quickly come to the junction with the North Country Trail (look for blue blazes). To go south (toward New York) on the trail angle left and go down the benched trail in the bluff to river level. To go north (toward North Dakota) on the trail turn right away from the bluff. Access- via sand FR 8799. You can park a couple of cars where the connector trail meets the road. Please do not park at the trail crossing on Dilling Road! 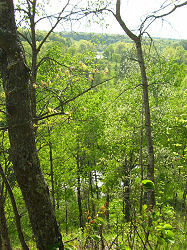 Follow the link for a description of the North Country National Scenic Trail in Lake County. There is an interpretive sign down on the Manistee River Floodplain. Follow the NCT connector to the trail and turn south. Descend to the floodplain and follow the trail a short distance. The sign will be on your right. 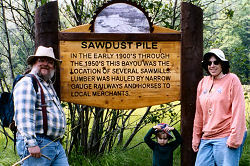 Sign reads, "Sawdust Pile: In the early 1900's through the 1950's this bayou was the location of several sawmills. Lumber was hauled by narrow gauge railways and horses to local merchants." Access- sand Forest Road 8799 off paved Dilling Rd. Restrictions- Self-pay. Recreation Fee Sticker required for parking. camping. There are self-pay tubes, see Huron Manistee National Forest fees for current price. No OHV's. 14-day camping limit. Other National Forest regulations apply. No camping along road. Other points of interest- North Country National Scenic Trail, and Tippy Dam access and campground is a bit farther south on Dilling Road. From Manistee, take M-55 east for 15 miles to Highbridge Road. Turn north. Brethren is reached in 6 miles. Turn east on Coates Highway and go 3.5 miles. Turn south on Dilling Road (in 1.8 miles you pass the North Country Trail crossing - no parking here!) and reach dirt Forest road 8799 in 2.1 miles. Turn right: reach the NCT connector in 0.2 miles, begin descending to river with campsites on each side, and the end of the road is in 1.1 miles. From M-37, turn west on M-55, and then north on Highbridge Road in 10.2 miles. Proceed as above.